Are you looking for a fresh Android app which effectively manages your financial business? May be there are lot of apps, but you’re not finding the right one! Because the one you’re searching for is here! 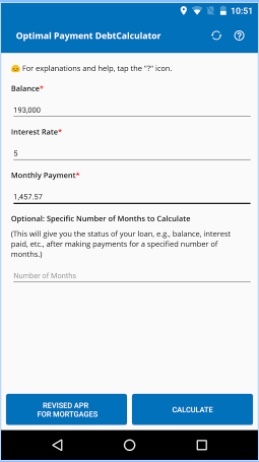 It’s called Optimal Payment Debt Calculator Android app developed by Elias Lorette. However, it’s not always necessary that you find the accurate app which is your cup of tea. So let me assist you and introduce to a new app which is really a breakthrough! Let’s experience quality app that will help in managing your financial business and professionally reducing your interest charges using this app. Also if you require app adding payments to the principal, then this Optimal Payment Debt Calculator Android has all the answers. More commonly the loans are set up to maximize the amount of interest paid, Optimal Payment Debt Calculator is qualitatively meant for those of people who have car loan, credit card debt, a student loan, or a house mortgage debt to pay off, and who like to minimize the amount of interest they have to pay. The vital purpose of the calculator is to determine which several payment amounts would allow you to reduce your interest charges as much as possible by changing the amount of the monthly payment or adding payments to the principal. With availability of other aspects the lender presented calculation allows you to view how long it would take you to repay the debt; how much interest you would pay, and the percentage rate of interest you would pay on the debt. By using this app they could adjust their monthly payment to achieve an optimal result. In case if users like to pay no more than $300 dollars interest on a 6000 dollar loan (5%), they could plug in the figures and calculate the amount you require to pay every month, until you reach a 5% result. It is illustrated that $457 for 14 months, given a loan rate of 8%. The users could also put in several payment amounts, until they search a payment that yields an interest rate which seems reasonable to you. In addition the users with this app could possibly view how much money that can be saved if you pay down the balance immediately with. In other words, you would get a 72% return on your $3000. With using this debt calculator the users could qualitatively determine that if they double the payment you are making, and direct that ½ of the payment goes directly to the principal, that users could save thousands of dollars, substantially lowering your actual interest rate. Many users could view lot of methods, strategies, and Android apps that could be actively used to track your debts. In addition this app would provide you a better starting point, so users could start their journey in advantageous manner. 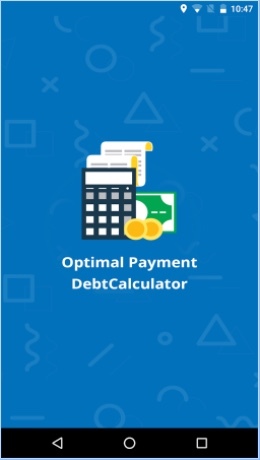 Optimal Payment Debt Calculator is a special title I’ll be coming back over again in the future, and I highly recommend it for anyone who thoroughly enjoys innovative app.